Mattress and box spring sets are a sizable expense for any household, costing anywhere from a couple hundred to thousands of dollars. It’s natural to want to protect your investment, so that it can safely and healthily serve your family for years to come. One of the best ways to guarantee a bed’s longevity is to protect it with a quality mattress encasement and box spring encasement. These covers protect against stains, bacteria, bed bugs, and other allergens and pests. However, many people purchase the wrong encasement for their bed, and don’t get the best comfort and protection as a result. If you are shopping for a mattress encasement, a box spring encasement, or complete cover set, you should know what the difference is between the products, and what to look for in bed protection. A quality mattress cover will not only protect your mattress, but provide a comfortable sleeping experience as well. After all, there’s no point in a cover that is stiff and uncomfortable; most people wouldn’t use a product like that for long, opting instead to sleep unprotected. Well-made mattress encasements, like the ones offered by SafeRest, will employ a terry cloth fabric on the surface. This provides protection that is breathable and noiseless, ensuring that you’ll be able to sleep comfortably with the cover in place. An additional membrane layer provides the secure barrier, blocking fluids and pests from reaching your mattress. Avoid cheaper encasements that use PVC or vinyl; these materials are much less comfortable to sleep on, and have been linked to asthma and respiratory stress. Since you won’t be sleeping directly on top of your box spring, you won’t need anything fancy like terry cloth to ensure sleeping comfort. However, you do still need the best protection you can get, and you’ll want to ensure that the box spring encasement can stand up to the additional stress of supporting the weight of the mattress and bedding on top of it. A premium box spring encasement will have a strong polyester surface that repels water while allowing air to pass through. The same membrane barrier can be found under the polyester surface layer. This ensures that your bed is protected from bacteria, stains, and pests, but won’t heat up due to heat being trapped in the covers’ materials. Mattress encasements and box spring encasements can be tough to tell apart. They’re generally the same color, have similar feels and textures, and are applied to their protective subjects in the same way. SafeRest’s encasements both use waterproof inner membrane layers for maximum protection, and the zippers are enclosed and aligned in the same way on both products. The two biggest differences are in the sizes and surface materials. Box springs have a standard size, rarely being under 6 inches or over 9 inches tall. This means that as long as you buy a box spring encasement for the correct bed size (i.e. queen, king, twin, etc. ), the encasement will likely fit just fine. However, mattresses are a different story: depending on the brand and model of your mattress, it could measure anywhere from 6 inches or 18 inches tall. This means that you’ll have to measure the thickness of your mattress before ordering a mattress encasement, since they have no size standardization. Breath-ability and comfort is what really sets out a premium encasement set from the rest of the pack. The terry cloth of a SafeRest encasement, and the polyester surface of their box spring encasements, ensure that you won’t wake up sweating in the middle of the night. However, you’ll want to be careful not to mix these up: the softer terry cloth is noiseless and won’t change the feel of your bed, so that’s the one you want to be sleeping directly on. Check the packaging before installing your encasements, to double-check that you have the cover for the right bed size, and that you’re not accidentally putting a box spring cover on your mattress (or vice versa). Be sure to wash your encasements before you put them on the first time, to remove any odors that might have come from packing and shipping the product to you. If you’ve confirmed or suspected a bed bug infestation, leave your encasements on for at least 18 months without removing them. Bed bugs can live for up to a year without feeding, so you’ll want to make sure that you’ve starved them all out before washing your covers. No single encasement or other product will solve your bed bug woes. To ensure that you get rid of bed bugs and keep them away from you, you’ll want to be more thorough. Encase your mattress, box spring, and pillows; elevate your bed with bed bug traps; steam-clean your rooms and furniture; and apply bed bug sprays and powders in cracks and crevices where bed bugs might be hiding. For more details, read up on our 4-step solution. 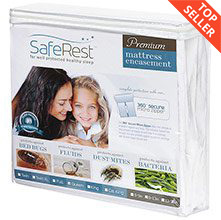 SafeRest bed bug mattress covers and encasements are used to protect and seal off the mattress and box springs preventing bed bugs from entering or escaping the mattress. All of our mattress encasements, bed bug covers, box spring covers and pillow covers are CERTIFIED BED BUG PROOF.